4 chambres, 3. 5 salles de bains, salle de jeux spacieuse avec table de billard, piscine privée. Le Sizzlin 'Sands offre une vue sur l'océan et le monument national Wright Brother. Détendez-vous sur les porches couverts et sur les terrasses bien exposées ou jouez au billard dans la salle de jeux spacieuse. Un plan d'étage ouvert fournit amplement d'espace pour de grandes réunions de famille. Toutes les chambres ont des ventilateurs de plafond. La chambre principale dispose de deux grands placards, d’un bureau, d’une salle de bains principale et de portes coulissantes en verre s’ouvrant sur le pont supérieur. Deux chambres doubles partagent une salle de bain Jack et Jill. La chambre avec lits superposés dispose de deux ensembles de lits superposés. Il y a une deuxième salle familiale avec un lit escamotable. Le Sizzlin 'Sands dispose d'une connectivité Internet sans fil, de télévisions à écran plat et de lecteurs de DVD Blu-ray. La plage est à seulement 300 mètres et cette maison est située au cœur de Kill Devil Hills avec de nombreux restaurants et lieux de divertissement à seulement quelques minutes. Il y a une laveuse et une sécheuse, un barbecue, des tables, des chaises et des chaises longues autour de la piscine. Un endroit idéal pour se réunir et profiter de vos vacances! We stayed at this home for 3 days the week after Labor Day. We had our family of four (children age 1 and 3) and Grandma. There was more than enough room for our small group. The large family/TV room and kitchen area were great for keeping the kids occupied while still keeping an eye on them when making dinner. The location is great - there are plenty of restaurants within walking or biking distance. The beach is only a block away and it was wonderful. The best part about the house - the POOL! It was relatively small, but it was warm, had plenty of chairs and room around it for sitting and sunbathing. It was clean and the beds were all comfortable! Looking forward to coming back next year! We enjoyed our stay very much. The house was perfect for our family of 8 and the beach was close by. The house was perfect for our family of 8. The main living area was large with a dining table for 8 and a workable kitchen. The house had 4 good size bedrooms which was a must. The house was decorated very tastefully. Most of us started the day with coffee on the porch, then on to the beach which was a short walk away. We all enjoyed the pool, especially the grandsons. The neighborhood was quiet and just a block from the main road. There was a lot to do in Kill Devil Hills and midpoint on OBX. We explored north and south without having to drive hours. This was everyone’s first visit to OBX and we would definitely go back again! Our family had a wonderful stay here. The house had all the amenities we were looking for and was tastefully decorated and very clean. The kitchen was well stocked making meal prep easy. The extra family room on the middle floor was a bonus. We enjoyed using the pool table. The walk to the beach was short, and the pool was very handy for the times we just felt like hanging around. There were plenty of deck chairs and pool toys. The location was close to many stores, restaurants, the Wright Brothers Monument, and Jockey's Ridge State Park. 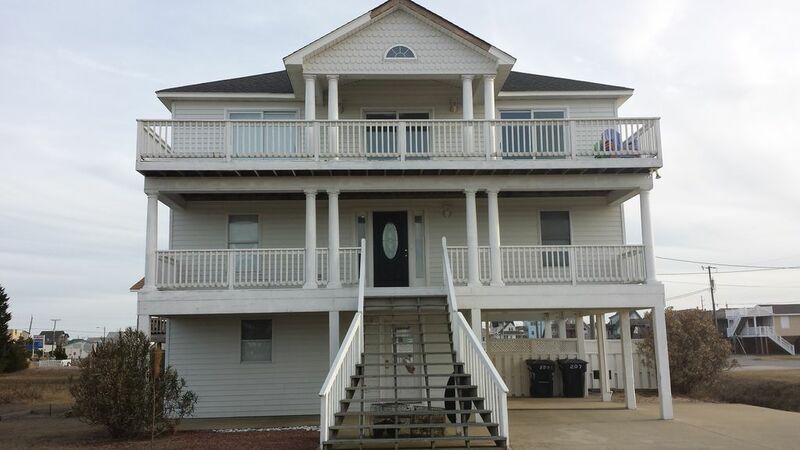 We would recommend this rental property to anyone seeking an enjoyable and relaxing stay in the Outer Banks. Great house. Hope to stay there again. Great stay great location. Would do it again. The place was just what the doctor ordered!! Private pool, close to the beach, well stocked kitchen. We had a great time. Thank you Robert, glad you enjoyed your time on the Outer Banks at the Sizzlin' Sands! 10% military discount! Will rent for less than weekly in off seasons and if full weeks are not rented 1 day before scheduled check-in during prime season.